At boarding school, we have a unique privilege that one does not always notice at first glance: the ability to choose when and what we eat. This privilege may not strike some as an important factor of going to boarding school, as they don’t understand the gravity of balancing meals. When at home, you are still under the jurisdiction of your parents. At school, Thacher students have full control over their food intake, a freedom most students in high school don’t fully have. This can be a good thing, but if abused, it could also provide devastating results found in the form of eating disorders. Causes of eating disorders are complex and multifaceted. Chemically, women with eating disorders produce higher levels of stress hormones, specifically cortisol and serotonin. In addition, eating disorders are not only physical, but highly mental illnesses. 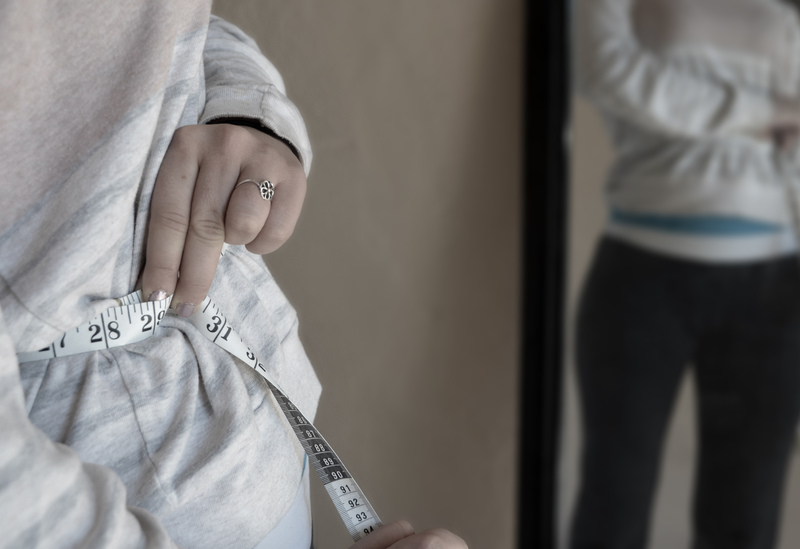 Patients with eating disorders are often also diagnosed with anxiety and obsessive compulsive disorder, or O.C.D., as young women seek an element of control in a seemingly uncontrollable world: their bodies. Eating disorders can affect any girl of any age, and of any size. Today, of women suffering from anorexia nervosa, 18-20% will die after 20 years of contracting the illness, and only 30-40% will ever fully recover. The mortality rate linked to anorexia is 12 times higher than any cause of death among women aged 15-24. With statistics so grim, one can only wonder if this debilitating illness affects young women at our school, how Thacher handles eating disorders today, and what steps are being taken for girls to attain a positive self image. 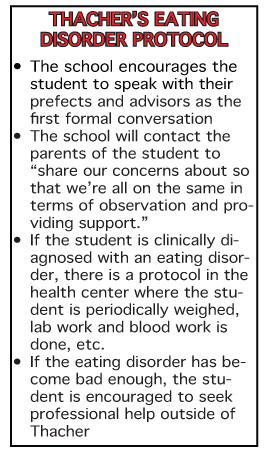 In a recent interview with Sabina McMahon, dean of students, she addressed the usual protocol for students with eating disorders, or “disordered eating”, as she stated was more appropriate for the issues she herself encounters with students. Generally, it’s a four step process listed to the left. Ms. McMahon, having dealt with numerous students coping with eating disorders in the past, also continued to describe the steps being taken by the Thacher Administration to encourage students, especially young women, to have a healthy self image. Education, she said, is the key to discourage unhealthy eating habits. It’s a balance, but what we try to do is provide education for students first and foremost. So really trying to help students understand nutrition and understand what our bodies need and what our brains need in terms of being the most effective student and healthy person we can be, and really, it’s about moderation. Secondly, she mentioned that Thacher provides a nutritionist for one-on-one communication about individual concerns and personal issues with certain girls. This combination displays the steps being taken towards discouraging disordered eating among Thacher students, and how the administration has encouraged healthy student lifestyles. Ms. McMahon also pointed out that eating disorders in this day and age are not only food related but exercise related, as many Thacher students, girls and boys alike, have shown signs of over-exercising. Over-exercising is a whole component that started being more publicly known about years ago, and so it’s considered in the disordered eating realm because basically, someone will be compulsively exercising to mitigate any kind of nutrition or eating that they’re engaging in. So it’s another thing to be aware of and observe and really work with students about. All women are at risk of contracting eating disorders, especially those at boarding school. 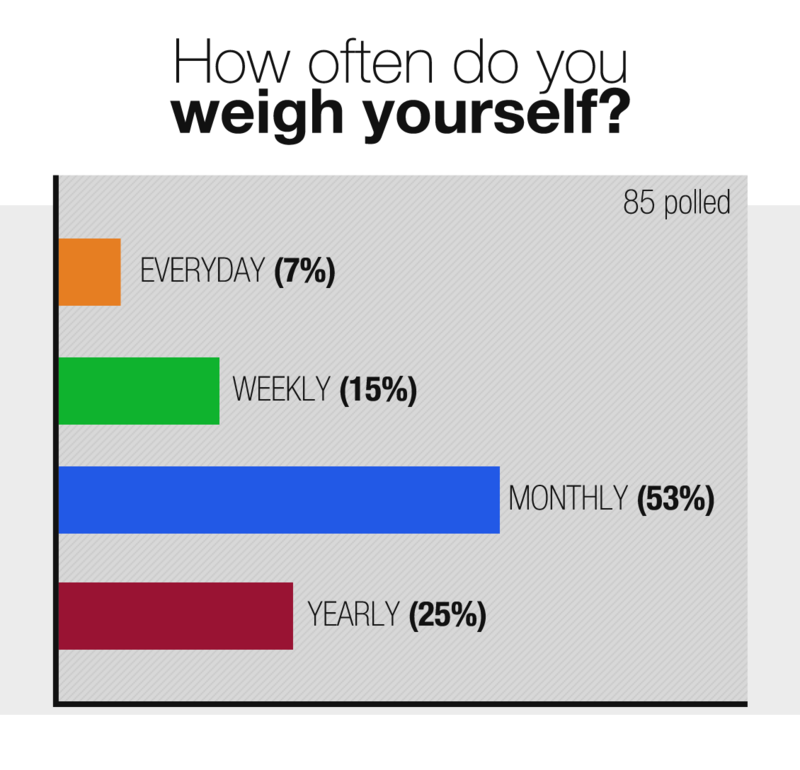 When given the choice of when and what to eat, teenage girls are always being compared by body image. Ms. McMahon even stated one of the biggest problems among teens at Thacher. Everybody lives together all of the time so there is a lot of comparison among the girls. That’s kind of the difficult thing, to help students feel good about who they are and that everybody’s body is completely unique and if you want to look a certain way it might not be possible for your body, for you to look that way, and how to have students feel good about who they are. In an interview with a Thacher student who previously struggled with disordered eating habits, she was asked what piece of advice she would give to Thacher girls about maintaining a positive body image. Addressing Thacher girls, she said, “Instead of trying to change how you look and focus on that, it’s more about embracing what’s good for yourself. You feel so much better if you’re confident with your body rather than trying to change your body.” She continued to echo Ms. McMahon’s comment about the issue of comparison among young women at Thacher. At Thacher, with such competition among young girls and pressure to fit the social norm of “perfection,” girls can be driven towards unhealthy eating habits. Thacher, though, has an effective system when handling student eating issues that first addresses the problem and takes the student step by step towards recovery. 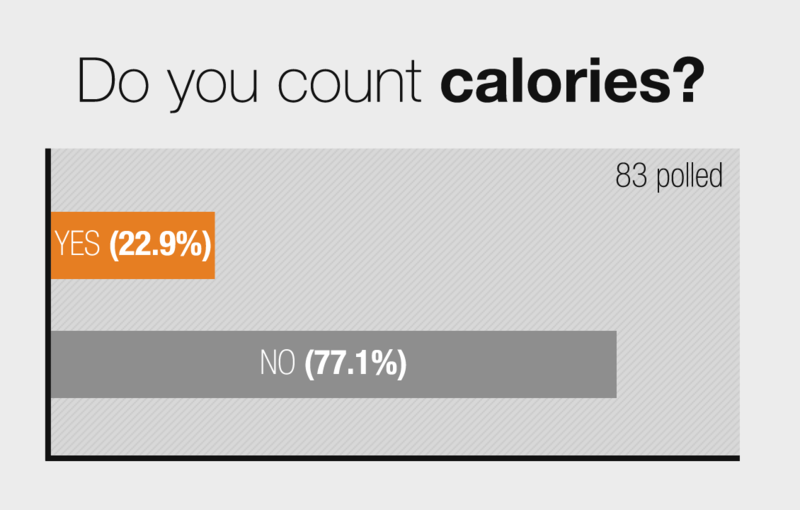 In a recent poll administered to girls at the Thacher School, 53% of girls weighed themselves only once a month, and 77% said they did not count calories, further suggesting the effectiveness of education about disordered eating. Though there is always room for more advances toward discouraging eating disorders, Thacher students are encouraged to live healthy lifestyles everyday of their Thacher career, and hopefully for the rest of their lives. Next postWhy is All of Thacher Concussed?